We are delighted to welcome Professor Tanja Junkers (Monash University) and Professor Jeremiah A. Johnson (MIT) as Associate Editors for Polymer Chemistry! Professor Tanja Junkers studied chemistry and graduated with a PhD in physical chemistry from Göttingen University. 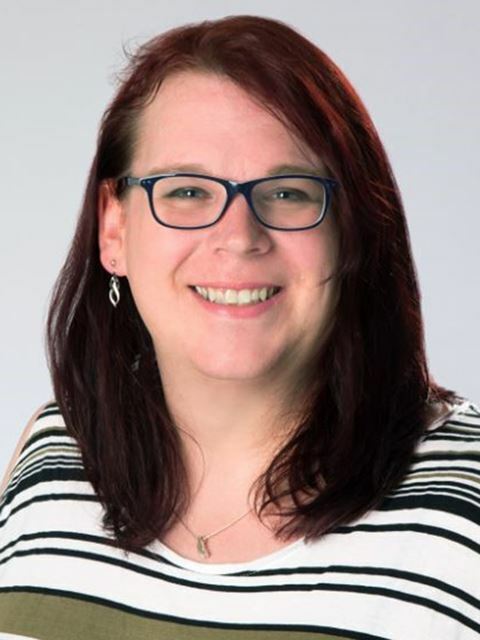 In January 2018 she became full professor at Monash University in Melbourne, she remains guest professor at Hasselt University and her group is currently active at both locations. 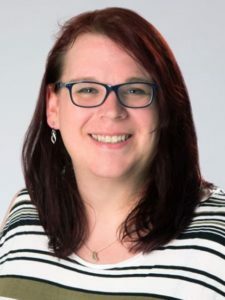 Her main research interests are precision polymer synthesis, use of continuous flow chemistry approaches, light-induced chemistries, polymer surface modification and investigations on kinetics and mechanisms of radical reactions. To find out more about her research read some of her recent publications below! Professor Jeremiah Johnson is now an Associate Professor in the Department of Chemistry at MIT. He was previously an Editorial Board member for Polymer Chemistry. 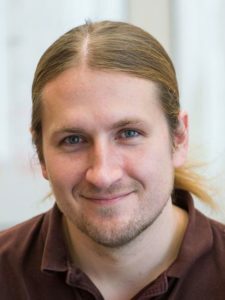 His research focuses on researching molecular design in three primary areas: nano-scale materials synthesis, macro-scale materials synthesis, and development of new chemical methods for modifying interfaces between bulk and nanoscale objects (surface chemistry). The tools of traditional organic and organometallic synthesis, synthetic polymer chemistry, photochemistry, surface science, and biopolymer engineering are combined to realize the design of target materials. To find out more about his research read some of his publications below! As Polymer Chemistry Associate Editors, Tanja and Jeremiah will be handling submissions to the journal. Why not submit your next paper to their Editorial Office? Yamaguchi et al. 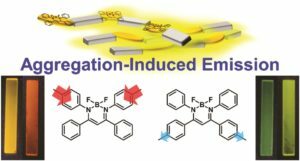 report the first example that allows to tune the luminescence properties with aggregation-induced emission-active conjugated polymers without changing the chemical components. The development of “element-block polymers” (defined as a minimum functional unit composed of heteroatoms) and the exploration of controlled methods for their electronic properties is crucial to design new tactics for advanced optical materials. Chujo, Tanaka and co-workers significantly contributed to this direction by developing a new concept for controlling the solid-state luminescence properties of polymers without changing the chemical components. This was achieved by synthesizing a series of alternative copolymers composed of boron diiminate with variable connection points to the comonomer units. The optical measurements revealed that the polymers possessed aggregation-induced emission (AIE) properties originating from boron diiminate. Importantly, the emission colour was varied from green to orange by altering the connection points in the film samples. Careful mechanistic studies suggested that the electron-donating and accepting abilities of the boron diiminate unit can be switched by selecting the connection points. As a result, the chain transfer character in the emission properties of the polymers was changed. Further theoretical investigations proposed that boron diiminate acts as a strong electron-acceptor in the excited state when the comonomers were connected to either one or both of the phenyl groups on the nitrogen atoms. On the contrary, when the comonomers were linked at the phenyl groups on the carbon atoms, a much weaker electron-donating property was induced. These findings pave the way for the design of advanced polymeric materials with precision function tunability without changing the chemical components. Conventional conjugated polymers can show emission only in solution, meanwhile these polymers can present intense emission even in the film. Solid-state luminescent properties were originated from AIE ability of the boron complex. Usually, drastic changes in chemical structures are essential for colour regulation of conjugated polymers. 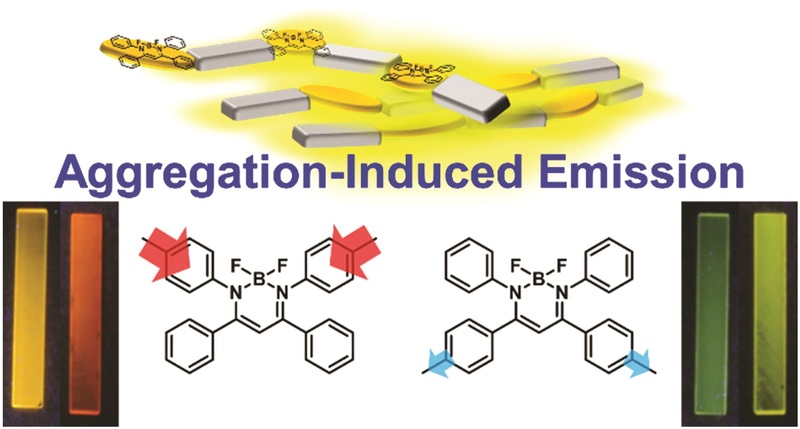 In this boron complex, originating from significant localization of highest occupied molecular orbitals in the boron complex, optical properties can be readily modulated by altering connecting points. Therefore, various types of luminescent materials can be obtained with the same chemical components. The monomers and polymers can be obtained through the several synthetic steps without special techniques. The intermediates and products showed high stability under ambient conditions. The purification for the polymers was simply performed with re-precipitation, and pure materials having good film-formability were successfully obtained. Dr. Athina Anastasaki is a Web Writer for Polymer Chemistry. She is currently a Global Marie Curie Fellow working alongside Professor Craig Hawker at the University of California, Santa Barbara (UCSB). Please, visit this link for more information. p-type organic semiconductor polymers can find a use in organic electronics, including organic light-emitting diodes (OLEDs), solar cells, and organic thin-film transistors. These materials offer unique characteristics over inorganic semiconductors such as flexibility and light weight. To maximize their potential, reversible deactivation radical polymerization (RDRP) methodologies are often used with traditional atom transfer radical polymerization and reversible addition/fragmentation chain transfer polymerization dominating in this area. To this end, Hudson and co-workers exploited Cu(0)-RDRP as an effective method for preparing functional acrylate-based polymers with p-type organic semiconductors as side chains. Impressively, all polymers were obtained in high yields (~ 90 %) with low dispersity and high end group functionality while the polymerizations displayed first order kinetics. Both low and high molecular weight polymers could be prepared in a facile manner and the choice of solvent seemed to be crucial to maintain good control over the molecular weight distributions. It should be highlighted that the described technique represents the most simple, low-cost and efficient way to synthesize these materials with improved end group functionality and yields over previous methods. The optical, electrochemical and thermal properties of each of these p-type materials were also carefully investigated with cyclic voltammetry and thermogravimetric analysis revealing the potential for further studies in optoelectronic applications. The Hudson group will now focus on the synthesis of more complex materials, including multiblock copolymers, and subsequently utilize them for optoelectronics. The Cu(0) wire should be prepared immediately before use for best activity, as substantial reductions in polymerization rate are observed when the wire is cleaned and stored. Reducing the relative amount of Cu(0) wire when attempting the synthesis of high molecular weight polymers reduces the polymerization rate, but provides improved control over the polydispersity of the products. For long-term storage all monomers should be stored in the freezer (–10 ºC), but are stable on the bench top under air for 1-2 days. Yields of pure monomers 5a-c are substantially improved when purification is conducted quickly (<5 min) on a short silica column to minimize decomposition; the same urgency is not required for 5d. Dr. Athina Anastasaki is a Web Writer for Polymer Chemistry. She is currently a Global Marie Curie Fellow working alongside Professor Craig Hawker at the University of California, Santa Barbara (UCSB). Please, visit this site for more information. Bao et al. report the synthesis of self-stabilized hydrophobic or PEGylated paclitaxel polymer prodrug nanoparticles through controlled radical polymerization approaches. Paclitaxel (Ptx) is one of the most widely used chemotherapeutic agents for the treatment of a broad range of human tumors. Polymer prodrugs are often employed to solve a number of issues associated with its limited water solubility, the absence of ionisable groups to enable Ptx salt formation and the short colloidal stability of its formulations. In a way analogous to polymer synthesis, the “grafting from” approach, also referred to here as “drug-initiated” consists of the controlled growth of a polymer from a drug. However, this approach is limited by the poor colloidal stability of hydrophobic drug-polymer nanocarriers and the lack of the direct synthesis of PEGylated prodrugs. Nicolas and co-workers managed to tackle these issues by developing a global method which enables the facile derivatization of Ptx followed by the subsequent reversible deactivation radical polymerization to design surfactant-free, Ptx-polymer prodrug nanocarriers with contrasting properties. In particular, nitroxide-mediated polymerization (NMP) and reversible addition-fragmentation chain transfer polymerization were elegantly selected to grow short polyisoprene or poly[(oligo(ethylene glycol) methyl ether methacrylate)] chains from Ptx in a controlled fashion. This allowed for the formation of either self-stabilized, all-hydrophobic Ptx-polymer prodrug nanoparticles or their PEGylated counterparts. Importantly, these prodrug nanocarriers exhibited high cytotoxicity on three different cancer cell lines, with chain length-cytotoxicity dependency and IC50 values comparable to those of the parent drug. This versatile approach demonstrates the robustness and the broad use of the drug-initiated method for the simple design of efficient polymer prodrug nanoparticles consisting of polymers of opposite nature, thus opening new perspectives in the nanomedicine field. The drug-initiated NMP of isoprene from Ptx is a very simple yet efficient method to prepare surfactant-free, stable polymer prodrug nanoparticles with high drug payload, without any protection/deprotection chemistry. When using the AMA-SG1 alkoxyamine for Ptx derivatization, the resulting Ptx-AMA-SG1 alkoxyamine is obtained as a mixture of diastereomers (this is related to the two chiral centers of the alkoxyamine). The signals from the NMR spectrum should be carefully assigned. Alternatively, the diastereomers can also be separated by column chromatography with a less polar eluent. 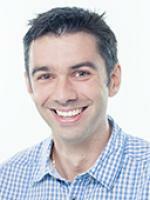 It is with great pleasure that we announce Prof Cyrille Boyer (University of New South Wales) as the recipient of the 2018 Polymer Chemistry Lectureship. This award, now in its fourth year, honours an early-career researcher who has made significant contribution to the polymer chemistry field. The recipient is selected by the Polymer Chemistry Editorial Board from a list of candidates nominated by the community. Cyrille received his PhD in polymer chemistry from the University of Montpellier II (Ecole Nationale Superieure de Chimie de Montpellier) and he is currently Professor at the School of Chemical Engineering, University of New South Wales (UNSW), co-Director of Australian Centre for NanoMedicine and a member of the Centre for Advanced Macromolecular Design (CAMD). He has received a number of awards such as the Malcolm McIntosh Prize for Physical Scientist of the year 2015, the 2016 LeFevre Memorial Prize, 2016 ACS Biomacromolecules/Macromolecules Award, the 2016 Journal of Polymer Science Innovation Award and the 2018 Polymer International – IUPAC Award. Cyrille has published over 200 articles and his research interests mainly cover the use of photoredox catalysts to perform controlled/living radical polymerization and polymer post-modification, the synthesis of polymeric nanoparticles for drug delivery (antimicrobial polymers) and hybrid organic–inorganic nanoparticles for imaging and energy storage. In the last few years, his team has pioneered photoinduced electron/energy transfer reversible addition fragmentation chain transfer polymerization (PET-RAFT) for the synthesis of functional polymers. We would like to thank everybody who nominated a candidate for the 2018 Polymer Chemistry Lectureship. The Editorial Board had a very difficult task in choosing a winner from the many excellent and worthy candidates. Please join us in congratulating Cyrille on winning this award! Becker et al. report surface-attached poly(phosphoester) which form surface-attached polymer networks and hydrogels. The undesired adsorption of bacteria, proteins and other biomolecules on surfaces of biomedical devices often triggers the formation of biofilms causing severe systemic infections. In order to circumvent this, functional polymeric coatings with antifouling and/or antimicrobial properties are typically used. Towards this direction, Wurm, Lienkamp and co-workers developed photo-reactive poly(phosphoester)s (PPEs) which form surface-attached polymer networks and hydrogels. To achieve this, a benzophenone-functionalized cyclic phosphate monomer was synthesized and subsequently copolymerized with ethylene ethyl phosphate (EEP) yielding hydrophilic functional polymers. Upon terpolymerization with additional comonomers polymeric materials with pentyl (PEP), furfuryl (FEP) or butenyl (BuEP) pendants groups were obtained. Importantly, all polymerizations were well-controlled with good agreement between theoretical and experimental molecular weights and low dispersity values. The copolymerization kinetics were carefully monitored via real-time 31P nuclear magnetic resonance spectroscopy indicating a gradient-like structure. The cross-linked surface attached PPE networks were then formed by spin-coating these polymers onto pre-functionalized substrates followed by UV irradiation. Importantly, the layer thickness could be varied between 56 and 263 nm and was dependant on the applied polymer and the hydrophilicity of the substrates. Atomic force microscopy was also employed to further characterize these materials showing a homogeneous and smooth morphology with static contact angles of 20-26° (for specific networks) and revealing hydrophilic surfaces. Given the biocompatible nature of PPEs, these networks can potentially be promising anti-fouling coatings candidates for biomedical devices such as implants or catheters. In addition, initial functionalization of the substrates using furane-containing PPE-coatings demonstrated that additional modifications can be performed therefore paving the way for more complex surface architectures. Synthesis of PPEs must be conducted under strict exclusion of moisture. The resulting copolymers are extremely hydrophilic. Thus, care must be taken to immediately cross-link them after spin-coating, or else they will de-wet from the surface. Chakma et al. exploit dynamic thiol-Michael chemistry to prepare dual responsive self-healing and malleable materials. Dynamically crosslinked polymeric materials have received significant attention owing to their unique characteristics including the introduction of mechanical properties and the possibility to extend a material’s lifetime. These materials can typically find use in a wide range of applications such as coatings and elastomers. Konkolewicz and co-workers significantly contributed towards this direction by developing a facile synthesis of dynamic materials with thiol-maleimide based adducts. Maleimides are of particular importance as they consist of a highly reactive vinyl group for thiol-Michael addition reactions and typically demonstrate very high yields under mild conditions. To synthesize such materials, a thiol-maleimide cross linker (2-((1-(2-(acryloyloxy)ethyl)-2,5-dioxopyrrolidin-3-yl)thio)ethylacrylate) was initially synthesized and subsequently incorporated into a polymer matrix of hydroxyethyl acrylate. The properties of the elastomeric materials were then carefully evaluated by tensile testing, creep recovery, swelling studies, differential scanning calorimetry and rheological experiments. It was found that these polymeric materials showed dynamic behaviours like self-healing and malleability at elevated pH values and temperatures. In addition, these materials possess significant healing properties and are mechanically stable towards creep deformation at room temperature and pressure. Their stimuli responsive self-healing, elastic, malleable and mechanically stable nature in combination with the facile nature of the synthesis paves the way for potential utilization in different applications that require enhanced properties and functions. 1. The synthetic techniques used to make the thiol-Michael based crosslinker (TMMDA) are very simple, but extra care should be given to store the crosslinker in the refrigerator or freezer. Storing the crosslinker at room temperature may result in background polymerization and eventually lead to loss of the crosslinker. 2. Although conventional free radical polymerization was used as a tool for polymerization, other polymerization techniques can be used as well. Although, reactivity of the thiol moiety has to be considered in that case. 3. Self-healing polymers are commonly responsive to single stimulus (e.g. temperature responsive Diels-Alder based polymer or light responsive disulfide polymer). TMMDA crosslinked materials developed in this paper have self-healing properties with both temperature and pH stimulus, giving them enhanced functionality and responsive character. 4. Dynamic materials synthesized in this article, based on the thiol-Michael reaction, showed malleability or reshape ability in response to both elevated temperature and pH. As a result, materials can be re-shaped into new configurations upon application of stimuli. 5. The thiol-Michael adducts are essentially static in the absence of thermal and pH stimulus, making the materials mechanically stable and creep resistant under ambient conditions.